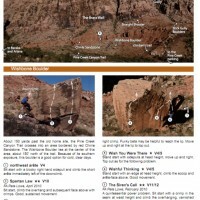 On a recent visit to Red Rocks outside Las Vegas, NV Alex Honnold soloed the 1000 ft. Original Route (5.12b) on Rainbow Wall and Prince Of Darkness (5.10c) in Black Velvet Canyon, down soloing Dream Of Wild Turkey (5.10a) to get off of the latter climb. He comments on his scorecard, “I know 8a doesn’t promote risk taking, but some experiences are life affirming.” Thanks to Luke for the tip. Further details, including thoughts from Honnold, are available at Climbing.com.